Chances are, we would have mocked Him. I am sure that we would prefer to believe that we would have seen through the lies, looked deeper than the appearances, and believed in Jesus. Maybe we imagine ourselves stubbornly standing by Him as all others abandon and condemn Him. But let’s be honest – the chances are high that we would have been there in the crowd, drunk with groupthink, baying for blood. And if not there, would we not have been doing everything to distance ourselves from a man that seemed by all accounts defeated and doomed to a terrible death. I do not suggest this to be insulting or cynical about human failings. I say this because I believe that it helps us begin to appreciate the lonely path of the Savior. 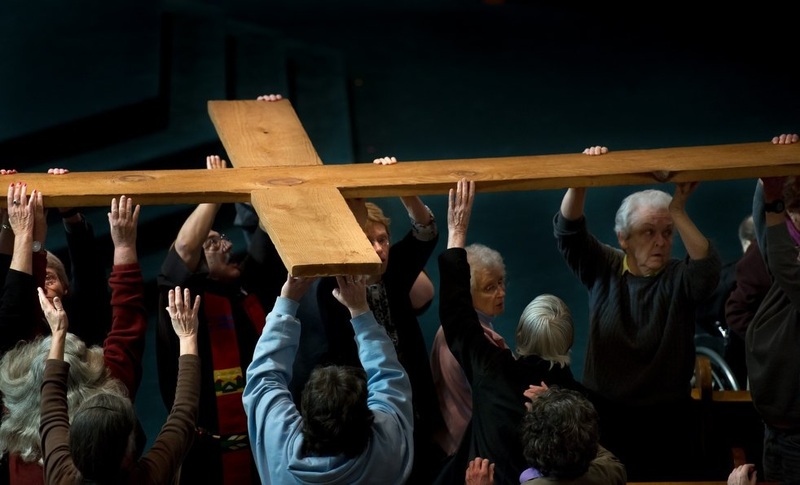 And there is a reason why the liturgy places those terrible words “crucify Him!” on our lips. Every Saint and Martyr can attest to the difficulty of standing up to the crowd – of walking with the crucified Lord. The human temptation is ever to demand our due, to master our fate, to imagine that we know what is right or true or good. And that temptation is made all the more alluring when others think and act likewise. In our first reading, we hear a lengthy passage from the fourth and last of the Servant Songs of the Prophet Isaiah. The terrible picture painted with these words is actually set in the midst of promises of deliverance and exultation. Now we hear the depth of the torment borne by the Servant – one who has remained faithful through the trials and will be vindicated by the Lord. The identity of the Servant remains a matter of debate, but it is likely that Isaiah himself saw the figure as representative of a faithful remnant of the people of Israel – a remnant whose fidelity in trials provides the seed for the Lord’s redemption and recreation of the people. In any event, it is not debatable that early Christians understood the Servant Songs a prophecies of the Christ. And they saw in Jesus the same miracle of fidelity and renewal – this time for humanity itself. In this prayerful reception of the text, we see that the Lord Jesus takes on the vocation of Israel – to be that light to the nations. In this case, His faithful and trusting acceptance of His torment and His tormentors fulfills the summons to covenant faithfulness. That gift of self provides the Father with the basis, the seed of a new and renewed humanity. His fidelity “justifies” the many. Even if He appears a horror to look upon, even if “counted among the wicked,” His beauty is that of One Who would endure any pain, pay any price – and all for the love of the Father and the human race. Psalm 31 echoes this theme of fidelity even in the face of rejection by those closest to the supplicant. He too knows the tragedy of the crowd that “sees red.” Nonetheless, the faithful one here places his trust not in fickle approval, but in the Living God. Hebrews is a difficult book for modern readers. Written originally to strengthen the faith of Jewish Christian believers, it draws upon Old Testament and Jewish liturgical traditions. In this passage, the text draws the attention of a persecuted people to the consoling thought that the Lord Himself has endured as much and more for their deliverance. This truth underlies their trust in the One Who loves them. The passage goes on to speak of Jesus’ own prayers for deliverance. And it alludes to Jewish traditions of the day – traditions that called for a good father to “discipline” his son. The book uses this analogy to speak of the transformation that has occurred for the Lord Jesus and for those who hope in Him. The Passion account in John’s Gospel draws on many of the same traditions as the Synoptic gospels. Even so, it offers a highly distinctive telling of the arrest, trials, and death of Jesus. Throughout this Gospel, the narrative has made it clear that Jesus is the Revelation of the Father’s Glory. It also emphasizes, even from the prologue, that the Revelation will produce a variety of responses from trusting faith (Mary and John the Baptist) to struggling faith (Peter and Mary Magdalene) to outright violent rejection (the leadership in Jerusalem). As John’s Passion opens, we see again the assertion of that Revelation – as Jesus fells the arresting crowd with those powerful, meaningful words: “I AM!” The series of trial scenes inside and outside the Praetorium use new imagery – that of the King of Israel – but continues this Revelation of Jesus’ exalted identity. The passages are centered on the scene where the soldiers ironically “crown” and acclaim Jesus as the “King of the Jews.” Just before this, Pilate inadvertently admitted the real question – it is one of truth – the truth of Jesus’ origins and identity. Jesus’ authenticity finds further expression from the cross itself as He establishes His new family (behold thy mother…), empowers that family with the gift of the Spirit, and feeds that family with the fountain of blood and water gushing from His side. Notice that the Passion account concludes when Joseph and Nicodemus come to give the body of Jesus a burial with royal dignity. But both of them, we are told, veil their faith in the Lord – Joseph is a “secret” disciple, Nicodemus came to see Him “at night.” Indeed it is hard to embrace the suffering Servant in His agonies. Perhaps it is easier to embrace a triumphant, resurrected Lord. But here on Good Friday – as the truth of His identity is revealed in His faithful suffering and death – we are confronted with the test. Will we stand with Him now when all despise and reject Him and anyone with Him? Will we walk beside Him up that hill? Will we trust Him with our living and our dying?